It's time again for Berry's digits challenge. I made this also last year and I liked it very much so I will do it again. Q: Do you try and keep your avatar’s body proportionate and similar to the “average” proportions in Berry's post? A: I tried to make my shape realistic but I never used a picture or something, I just used my visual judgement. Q: What do you dislike the most about the SL avatar mesh? 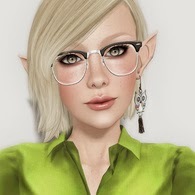 Q: Does it bother you when you see other avatars that are not proportionate at all? A: No, everyone can be as she / he likes. But I don't like the invisible pony ride legs. Q: Even though this is a virtual world and people can be anything they want to be, do you feel when they are in human form, they should try to keep their proportions close to average? A: No. I like the diversity, thats one of the best things in SL. I'm seeing a trend toward the dislike of the pony-riding shape. I'm in that camp, too!